Milblogging.com's one-of-a-kind index of military-themed blogs categorizes content by each U.S. branch of military service, as well as the labels of spouse, parent, reporter, supporter, and veteran. With an eye toward generating a constructive conversation about how to inspire others to document and share their military experiences online, perhaps it might be useful to consider by content, rather than by author's experience, uniform, or vocation. This isn't intended to replace or redefine Milblogging.com's labels, but to offer a different way to look at blogs and other forms of online communication. As an additional benefit, this exercise might encourage would-be communicators to consider forms and formats outside of "traditional" blogs, including: social media outlets such as Facebook pages, microblogging tools such as Twitter, or visual-media channels such as Flickr or YouTube. What are we missing? What other suggestions do you have? This is second part of a two-part series on suggested Tactics, Techniques, and Procedures (T.T.P.) 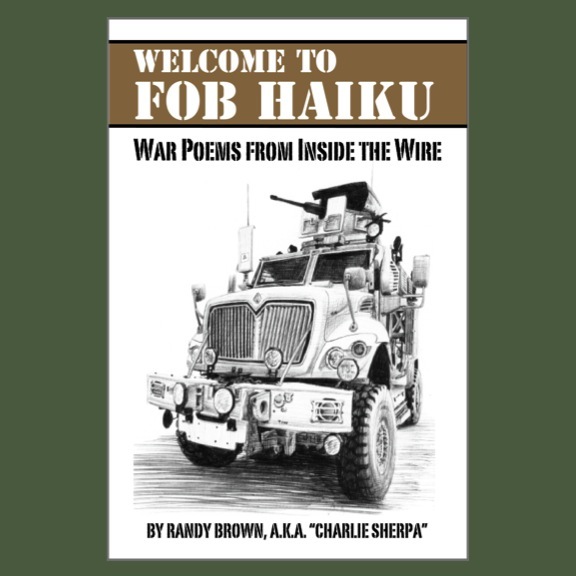 for writers of military-themed blogs. For Part I, click here. Make blogging a habit. Put yourself and your readers on a schedule, and stick to it. Keep writing. Even when you don't feel particularly inspired. Bonus tip: Before you publish a blog publicly, write it privately for at least 30 days. That gives you time to get into a rhythm, find a voice, and experiment with different visual designs and add-ons/widgets. Some people even decide to keep their blogs accessible only to friends and family. A mil-blog doesn't have to be public. Before every trigger-pull ... breathe. Use an off-line editor such as MarsEdit. Set your blog-posts to publish at a specific time, hours or days after they're written. That gives you some time to discover typos, or to think of better ways to say what you mean. Sherpatude No. 18 ("Your trigger finger is your safety ...") applies to the "send"/"publish" key as well. Put social media in its place. Establish a Facebook page for your blog. Connect your blog to Facebook via an application such as Networked Blogs. The application will automatically re-post blog entries to Facebook. Given evolving readership trends, you may find you have more readers and comments on Facebook than you do on the blog itself. "Write once, publish many." That said, remember that social media only feels like work. It's not actually producing anything. The blog's the thing, not making snarky comments or posting funny pictures. Set a timer for yourself, then get back to the blog. Don't pay for your blog-hosting service. I use Google's Blogger, also known as Blogspot. Other friends use Word Press. Both are free. Do pay for your own domain/URL. Some governmental computer networks automatically block web-addresses that include words such as "blogspot" and "wordpress." You can't blog to the military masses if your site is blocked on governmental computers. You can buy a domain for something like $5 to $25 annually. Give someone else the keys, just in case. If you're going downrange, the unthinkable can and does happen. Plan for injuries and outages. Give someone back home log-in/password access to your blog, in case it needs to be shut down, permanently or temporarily. Besides, given the way the Internet interconnects via some parts of the world, you might also have to use this person to unlock your accounts. The blog-service police tend to regard multiple log-ins from Afghanistan, Germany, and India on any given day as an attack, rather than as a poor blogger downrange attempting to administer his/her blog comments. Recognize that experiences vary. Just because the Army is one way for you, doesn't mean that it's that way for everyone in the Army. Times change, procedures evolve, situations are fluid. Every experience, including your own, is "Army of One, sample of one." Anecdotes do not equal analysis. Feelings aren't facts. See also Sherpatude No. 3: "Never speak with complete authority regarding that which you lack direct knowledge, observation, and/or suppressive fires." Words matter, but pictures help. A photo or other illustration will increase the number of readers to a given post. Beware of copyright infringements, however. Always use your own photography, or images that are shared via a collective commons license. Register your blog. Register and claim your blog at Milblogging.com. It's a good way for new readers to find and follow you, as well as to find and follow other bloggers. Keep it short. For optimal readability, most blog-posts should be no more than approximately 500 words in length. If you've gone on too long on a given post, consider breaking it into parts. Finally, don't worry about summation. When a given post feels finished, end it. As mentioned in a previous Red Bull Rising blog-post, a couple of readers asked for Tactics, Techniques, and Procedures (T.T.P.) on "How to Write a Mil-blog." With the usual "lessons-learned"-style caveats about my being both an Army of One and a Sample of One, what follows is a quick run toward some helpful hints. More caveats: Your results may vary. Void where prohibited. Take what you need, leave the rest. Choose your own adventurous identity. "On the Internet, no one knows you're a dog." As a journalist, I've been trained to avoid citing anonymous sources and to view the use of pseudonyms suspiciously. That said, I realize that loved ones—especially kids—don't always like to appear in print. There's also the question of your co-workers and fellow soldiers: Regardless of whether you live in on a FOB or in a foxhole, you also have to train, fight, win, sleep, and eat with the guys and gals next to you. Because of all that, for purposes of safety and sanity, you may wish to mask people's identities. You may also wish to mask your own, because Uncle Sam is occasionally a little bi-polar when it comes to blogging. The same guy who made you a lean, mean killing machine is also the one who issued you a Reflective Safety Belt. Personally, I started writing under a pseudonym because, while preparing to deploy in 2009, I was confused and confounded by Army rules and regulations regarding use of social media. Keep in mind, IT WAS PART OF MY ARMY JOB to advise my command and fellow staffers regarding uses/risks of social media. I was an internal communicator (and blogger) by day, and a mil-blogger by night. Although that sounds a little like a mission brief that starts off with "Assault Team Fox will secure Objective Henhouse,"creating the "Sherpa" allowed me to established a bright line between on-duty and after-duty. With all my various identities and log-ins, by the way, my buddy Archer started calling me a "4th Level Sock Puppet." So, I'm a fan of pseudonyms. Years after the fact, the "Sherpa" persona continues to be useful. Sherpa is neither a commissioned nor warrant nor enlisted soldier. Who he is depends on where he is and who you are. Sherpa is neither trigger-puller, Fobbit, nor stay-at-home Jody. Sherpa can play stupid when necessary, and be a smart@$$ when he wants to. The real guy wearing the mask can't always do that. Besides, Sherpa and I know different people. We tend to lead separate lives. As long as any given post connects to some or all of your three passions, you'll keep a tight topical shot-group. Never write anything you wouldn't say to someone face-to-face. I learned a variation of this in journalism school: "Never write anything you wouldn't want to see on the front page of The New York Times." Either way, it distills to this: Never write anything you wouldn't want to explain or defend. That goes for e-mail messages, news articles, love letters, Facebook hacks, and blog posts. Pick your fights wisely. The old summer-camp-and-dorm-room rule applies: Never talk religion or politics, they just stand in the way of a good time or mutual understanding. You have your opinions. Let other people have theirs. Let's talk about what matters, mil-bloggers. Let's talk about the troops. Be open to all. Blogging is a journey, not a destination. You meet a lot of people along the way. Take wisdom and advice, wherever you find it. That grandmother in Kentucky knows more than you do about bloggers and blogging, as well as what's happening overseas. So does that Army doctor's wife, who turns out to be a freelance writer who shares an interest in educating youth about writing. So does that mischievous Medieval Sheila who sends pink musk-sticks in care packages to our troops downrange. Personal note: I would not be the blogger I am today without a lot of help from Kentucky Woman, Kanani Fong, Mari Paxford, Jeff Courter , Ben Tupper, David Stanford at Doonesbury's "The Sandbox," Tom Ricks, Carl Prine, and Doctrine Man!! Thanks, everyone, for your words and votes of support for the Red Bull Rising blog last week. The blog was named as a finalist in the "Reporter" category of the 2012 Milbloggies. Voting is now closed, and the ballot box is sealed until the 2012 Milblog Conference in Arlington, Va, May 11-12. While it's a lot of fun rustling and wrangling for votes, the real value of the annual "People's Choice"-style contest is the opportunity it provides to discover (and re-discover) different voices and blogs. Tracer-fire always points both ways, of course, and the nomination of Red Bull Rising blog generated a few queries from new friends. A couple have even asked for Tactics, Techniques, and Procedures (T.T.P.) on how to get started blogging themselves. I'll look forward to using that as a writing prompt for a post later this week. "The Horseshoe Formation." Written by a deployed and anonymous "U.S. Army Captain without a Formation." "Fear and Loathing in the Infantry." Written by another anonymous junior Army officer (?) downrange. "With a Bible in My Ruck." New York National Guard soldier Jonathan Raab's blog has been relatively quiet since his arrival in Kuwait. This may be due to difficulties in coming to an agreement with his command regarding his writing. Or it may have to do with his contracting mononucleosis, as indicated at his girlfriend's new blog. Either way, check out his April 22, 2012 "Daily Beast" essay regarding how soldiers downrange perceive service in Kuwait vs. service in Afghanistan. "The Duffel Blog." A satirical faux-news blog similar in tone to the The Onion, this tongue-in-cheeky site has quickly proven to be a free-fire zone of above-average barracks humor. They leave no boundary unbreeched, no button unpushed. In an April 23, 2012 item titled "National Guard unit takes wrong turn ...", for example, the site even reported that 1st Brigade Combat Team (B.C.T. ), 34th Infantry "Red Bull" Division (1-34th BCT) recently re-invaded Iraq! 2012 Milbloggies: Vote for Red Bull Rising! The Red Bull Rising blog is a finalist under the "Reporter" category of Sixth Annual Milbloggies awards, conducted by Milblogging.com. In the "People's Choice"-style contest, readers vote for their favorite military-themed blogs. Categories range from Army, Air Force, Navy, Marines, and Coast Guard blogs, to those written by military parents, spouses, supporters, and veterans. Voting starts Tues., April 17 and ends Fri., April 20. To vote for the Red Bull Rising blog in the 2012 Milbloggies' "Reporter" category, click here. 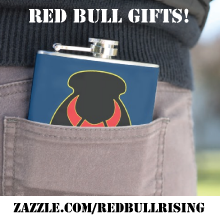 To follow the Red Bull Rising blog on Facebook, click here. In 2011, the Red Bull Rising blog was a finalist in the "Veteran" category. That year, nominations occurred slightly before the blog's writer embedded as civilian media with the Iowa National Guard's 2nd Brigade Combat Team (B.C.T. ), 34th Infantry "Red Bull" Division (2-34th BCT) in Eastern Afghanistan. "The Milbloggies competition always seems to be fierce, friendly, and fiercely friendly," says Charlie Sherpa, the pseudonymous writer of Red Bull Rising. "It's no-Bull to say that it's an honor just to have Red Bull Rising appear alongside some real mil-blogging mainstays." Sherpa noted there was no category specifically addressing his experiences as a "recovering journalist, Army veteran, self-appointed unit historian, and court jester." 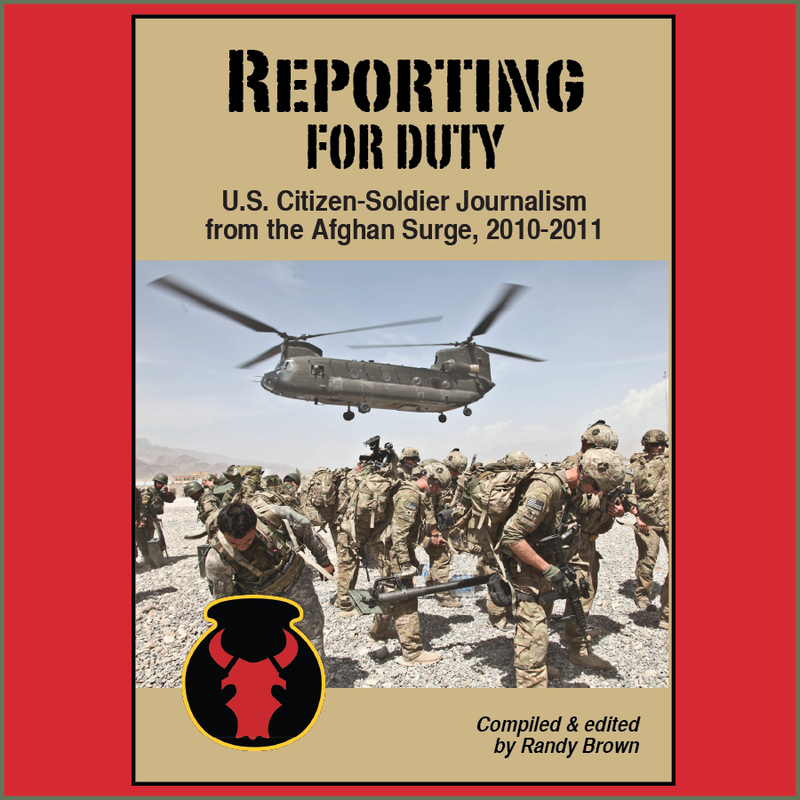 "I keep a pretty tight shot group on content, and aim to provide a mix of news, humor, and first-person lessons that communicate the citizen-soldier experience," says Sherpa. "The journey has been an enlightening one for me: starting in 2009, starting out with pre-deployment and mobilization training, to actions on the ground and life downrange, to homecoming topics such as family reintegration, Post-Traumatic Stress Disorder (P.T.S.D. ), remembering the fallen, and civilian unemployment." Vermont's 86th BCT, deployed to Eastern Afghanistan, 2009-2010. Oklahoma's 45th BCT "Thunderbird", deployed to Eastern Afghanistan, 2011-2012. Minnesota's 1-34th BCT "Red Bull", deployed to Iraq 2005-2007; Iraq/Kuwait 2011-2012. Ohio's 37th BCT "Buckeye," currently deployed to Northern Afghanistan. Winners will be announced at the 2012 Milblog Conference in Alexandria, Va., May 11-12. The Milbloggies contest is sponsored by USAA. U.S. Army: "Afghan Blue III," written by a U.S. National Guard soldier with Ohio's 37th BCT, currently in Northern Afghanistan on his third overseas deployment. U.S. Marine: "Castra Praetoria" written by the recently promoted "America's Sergeant Major." Vote for him or the zombies win. U.S. Military Parent: "My Yellow Ribbon," written by a proud Red Bull parent who is also a previous winner in that category. U.S. Military Spouse: "The Kitchen Dispatch." U.S. Military Supporter: "Assoluta Tranquillita." For a list of all finalists and categories, click here. To vote in all categories, click here. Polls close Fri., April 20, at 7 p.m. EDT/4 p.m. PDT. Voting is limited to one per IP address. For more rules and Frequently Asked Questions (F.A.Q.) about the 2012 Milbloggies, click here. Merle Hay Road in Des Moines, Iowa, is a busy north-south road that links a decades-old retail and commercial district to Camp Dodge, the largest military installation in the state. In addition to strip malls, shops, and restaurants, there is notably an Earl May Nursery and Garden Center located on Merle Hay Road. The business has multiple Des Moines locations, but only one that invites this locally popular alliteration: "The Earl May on Merle Hay." In these parts, that passes for practically poetic. The street is notably named after the first U.S. soldier from Iowa—and perhaps the first American soldiers—killed in World War I. Merle David Hay, 24, was one of three U.S. 1st Infantry Division soldiers killed in trench warfare near Bathelémont-lès-Bauzemont, France, Nov. 2-3, 1917. The best memorials gently jolt us out of our routines and distractions, and remind us of those now missing from our daily lives. I have to admit, however, that I drive on Merle Hay Road nearly every day, but that the experience rarely causes me to reflect upon World War I. I'm in too much of a hurry. Other people are, too. In another life and job, I write about architecture, construction, and community planning. Personally and professionally, I love exploring the ways that we invest meaning in places and things. Whenever I travel to our nation's capital, I make a point of visiting the Vietnam Veterans Memorial. When I find myself on the grounds of Camp Dodge, I try to stop by the 34th Division Memorial, a small monolith that commemorates the Red Bull soldiers of World War II. In today's media hustle and 24-hour traffic, however, stone walls do not always an ideal memorial make. It's a question of mental space as much as it is physical real estate. How do you make an everyday memorial, one that busy people will find meaningful and not morbid? One that's accessible, without risk of becoming commonplace? How does one person make a difference, helping to keep alive the memory of a friend, buddy, or family member? Naming places and things, after all, takes some amount of collective time, effort, and money—people working together as towns, neighborhoods, or non-profit groups. That said, streets, schools, buildings, parks, and trails are all good venues for commemorating individual soldiers, units, or even veterans in general. Personally, I'd much rather see the names of public spaces evoke themes of duty and service, rather than have them sold to the highest bidder. 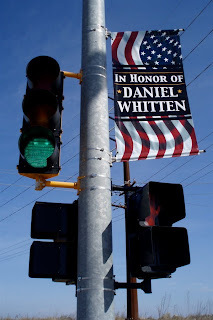 And, as mentioned in previous Red Bull Rising posts, towns and groups can also commemorate fallen soldiers with street banners and billboards. So, where does that leave the rest of us, acting as individuals? One of my old Army buddies makes a practice of posting via social media the names, ages, and of those soldiers who were killed during his unit's deployment to Iraq. Another ensures his unit's Facebook page commemorates the anniversary dates of those killed. And I've taken to subscribing (by "liking") the Facebook pages of entities such as Iowa Remembers Inc., which regularly commemorates those Iowans who have been killed in service to their country. Here's a typical entry: "Remembering an Iowa Hero ... Army Sgt. Brent Maher, 31, Honey Creek, Iowa - 4/11/11. He is not forgotten." That's short, sweet, to the point. It's almost "name, rank, and serial number," except for the little touches, like dates and hometowns. And "he is not forgotten" gets me everytime. Organize or participate in a memorial motorcycle ride or bicycle ride. Wear a photo button or commemorative bracelet naming a fallen soldiers. Or, if the soldier is an immediate family member, wear a gold star lapel pin. When people ask about what you're wearing, be prepared with a short answer or story about your soldier. Organize or participate in a memorial run or walk. 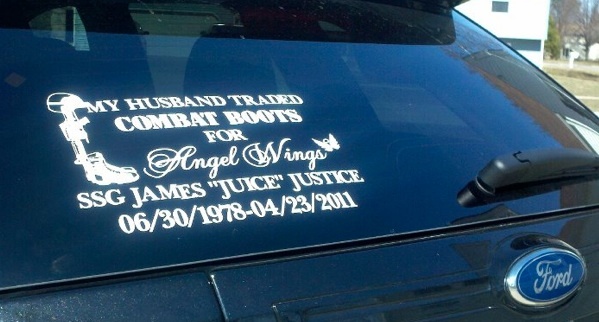 Place an automotive window decal on your personal vehicle, identifying a fallen soldier. 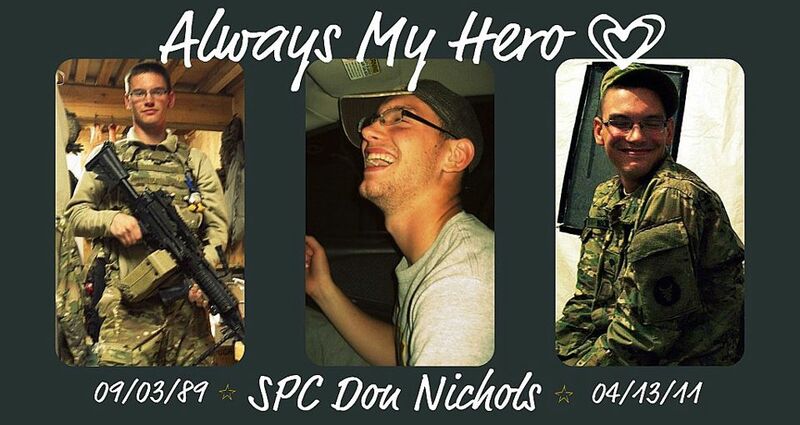 Post a Facebook cover photo depicting a fallen soldier. Post a Facebook status, photo, or other social media update with the soldier's name and date of death. The best memorials aren't designed to make people feel bad or guilty, but to remember and celebrate a life. 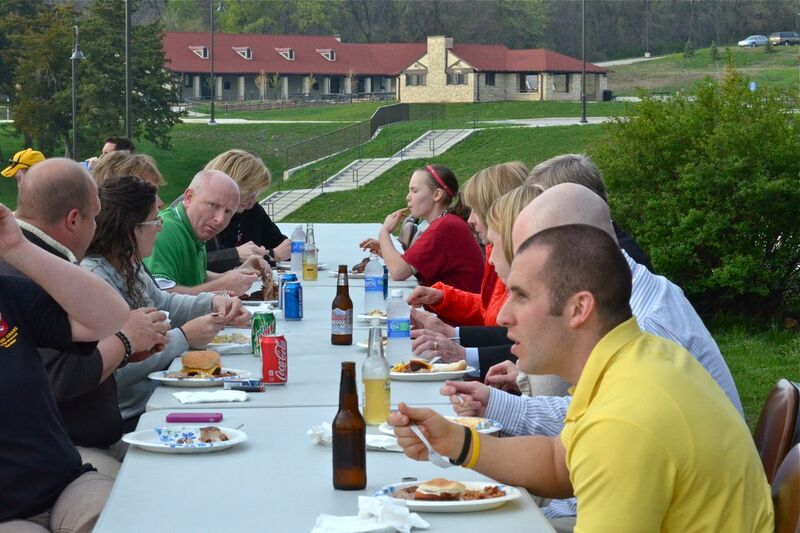 What other 21st century ways have you seen to commemorate fallen soldiers, friends, and family? 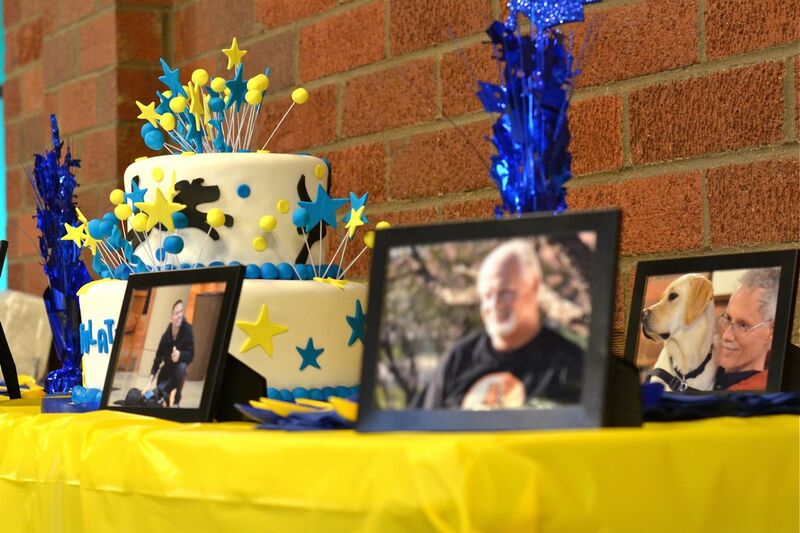 What can you do to help keep their memories alive? Examples of Facebook cover photos courtesy of Chelsey Bliss (for Spc. Donald Nichols) and Amanda Justice (for Staff Sgt. James Justice). Like an old tactical radio, Sherpa's personal Facebook net has crackled to life recently, with traffic regarding 2nd Brigade Combat Team (B.C.T. ), 34th Infantry "Red Bull" Division (2-34th BCT), Iowa Army National Guard soldiers killed in Eastern Afghanistan last year. Anniversary stories make for lazy journalism, but they're also easy emotional handholds—especially for those of us either back home or left behind, who are struggling with What It All Meant. "All gave some, but some gave all." With all the clutter and din of daily life, that's sometimes a little too easy to forget. I don't know about you, but I appreciate the occasional emotional radio-check. Helps maintain one's perspective, and priorities. Spc. Brent M. Maher, 31, of Honey Creek, Iowa. Killed in IED attack, April 11, 2011, Paktiya Province. Member of 1st Battalion, 168th Infantry Regiment (1-168th Inf.). Spc. 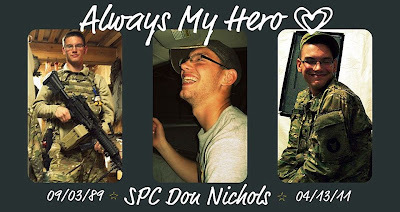 Donald L. Nichols, 21, of Shell Rock, Iowa. Killed in IED attack, April 13, 2011, Laghman Province. Member of 1st Battalion, 133rd Infantry Regiment (1-133rd Inf.). Staff Sgt. James A. Justice, 32, of Grimes, Iowa. Killed by small-arms fire, April 23, 2011, Kapisa Province. Member of 1st Squadron, 113th Cavalry Regiment (1-113th Cav.). Operation Never Forgotten, a non-profit organization based in Saline, Mich., promotes patriotic messages that encourage others to celebrate and remember military personnel and their families. 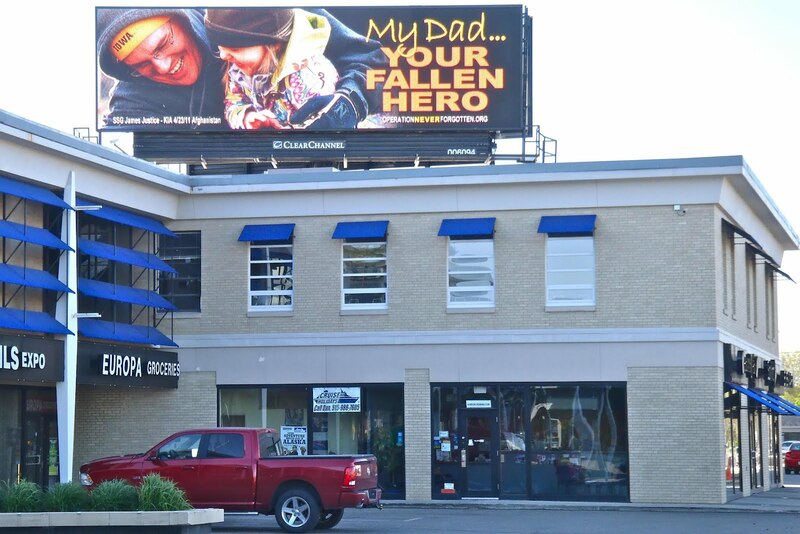 Through its "Billboards for Heroes" program, the organization helps memorialize fallen soldiers through the production and placement of digital public-service advertisements. The larger-than-life pictures portray the soldiers not only as military men and women, but as parents, partners, and members of a community. Starting Mon., April 9, some 14 Des Moines, Iowa metro area billboards owned by Clear Channel Outdoor have borne the image of Staff Sgt. James "Juice" Justice and his daughter Caydence, along with the caption "My Dad, Your Fallen Hero." In one, he wears a fleece cap bearing the logo of his beloved University of Iowa Hawkeyes. The graphics rotate with other advertisements for colleges and cellphones, staying on screen for approximately 10 seconds each time they appear. Even if it makes someone think for five seconds while they're driving get to work [...] Or if it brings tears to your eyes [...] I hope it makes people remember and feel something, and just take a second to think about what someone is willing to give up for them [...] I just don't want any of them to be forgotten. 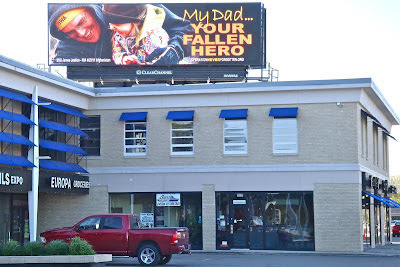 At least one of 14 fatalities suffered in 2011-2012 by 45th BCT ("Thunderbird") has also been memorialized through the Billboards for Heroes program. In July 2011, the Oklahoma National Guard unit replaced Iowa's 2-34th BCT in Eastern Afghanistan, and returned home earlier this month. Three Iowa and two Nebraska citizen-soldiers were profiled in anniversary stories that appeared in the Omaha World-Herald, Sun., April 1, 2012. The soldiers were part of the 2nd Brigade Combat Team (B.C.T. ), 34th Infantry "Red Bull" Division (2-34th BCT) deployment to Eastern Afghanistan, from August 2010 to July 2011. Omaha World-Herald reporter Joe Morton and photographer Alyssa Schukar embedded with the units, first at Fort Irwin, Calif. in fall 2010, and again in Afghanistan, spring 2011. Alexis Trucke: "I'd like to deploy again, someday"
Jeremiah Afuh: Finding a job is "like everything else. You have to fight for it." John Kerschner: "I believe in our freedoms, and I believe in taking personal responsibility for them"
William Gomez: "My dream has always been to become a soldier"
John Matheson: "Say something nice about my wife. ... She's a hero in my book"
In Feature photos, a first-place photo depicting a young Afghan boy amidst a sea of women wearing blue burkas, awaiting a wintertime humanitarian delivery of flour, sugar, cooking oil, and tea by Nebraksa's 1st Squadron, 134th Cavalry Regiment (1-334th Cav.). In the Spot News category, a third-place photo depicting an Iowa cavalry trooper smoking a cigarette after a firefight with insurgents in Parwan Province. The caption reads: "With the blood of an insurgent fighter on his hand, Spc. Brandon Dykun smokes a cigarette shortly after engaging in contact with two insurgents in a dry ravine near the village of Walli Kalay on April 7, 2011." Dykun was deployed with Iowa National Guard's 1st Squadron, 113th Cavalry Regiment (1-113th Cav.) Both the Nebraska and Iowa cavalry units were part of 2-34th BCT deployment to Eastern Afghanistan, from August 2010 to July 2011. Approximately 3,000 citizen-soldiers participated in the deployment. 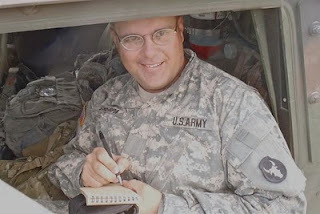 Some of the best feedback we received from our time spent as embedded journalists with the Nebraska and Iowa soldiers there came from simple portraits of soldiers with quick question-and-answer interviews, which we posted almost daily to our At War, At Home page. I found that family members were eager to hear any news of their deployed loved ones, and soldiers were quick to take the opportunity to talk about why they joined the National Guard and who was waiting for them back home. The time changed me in surprisingly positive ways. 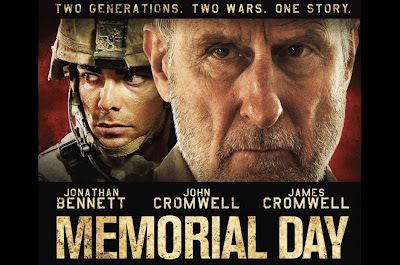 I wanted to see the soldiers again, to learn how Afghanistan affected them and what their lives were like now. In the past few months, I revisited five of the 60 soldiers whose portraits I took while I was embedded. Talking with them was very rewarding. We spoke of our shared experiences in Afghanistan and adjustments to life back in Nebraska and Iowa. It's a sultry spring Friday afternoon outside the Gold Star Museum on Camp Dodge, Johnston, Iowa. The sun is out, the wind feels soft, and you can smell the earth. Even the military-grade grass on the adjacent parade field is beginning to turn green. To every thing, there is a season. Inside, there is happy chaos. A hundred little crises have come together in an event that seems part high-school graduation open house, part family reunion, part end-of-season sports team banquet. The mood is upbeat and bittersweet, and there's often not a dry eye or nose in the room. A few funny stories, an emotional music video, and plenty of puppies. Labrador Retriever puppies, both black and tan. Nobody plays "Pomp and Circumstance" (or should that be "Paws and Circumstance"? ), but, later, there will be marble cake. And a barbecue. Because nothing good happens in Iowa without grilling a sacrifice. More than 50 people have turned out to celebrate the next steps forward for nine Midwestern veterans and their new canine partners. 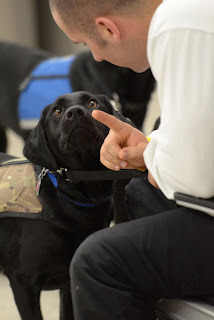 The dogs are psychiatric service and mobility animals, trained by Paws & Effect to perform physical tasks that mitigate conditions such as Post-Traumatic Stress Disorder (P.T.S.D.) and limited ranges of movement. They are trained to respond to their handlers' flashbacks or nightmares, for example, or to retrieve objects that are out of reach. While the animals no doubt also provide an emotional or therapeutic benefit—in covering these kinds of stories, news reporters typically cite here the calming effects of pet ownership—they are not pets. Neither are they "companion," "emotional support," or "stress-relief" animals. They are working dogs, heading out into a working world. 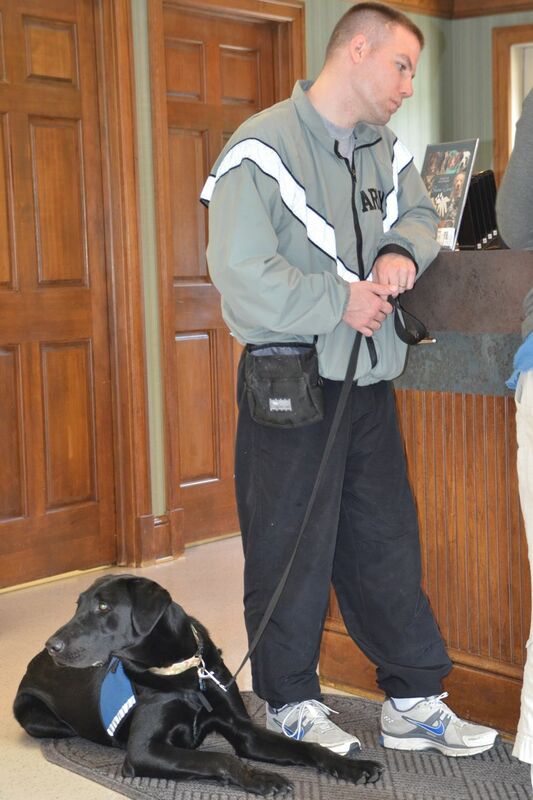 Since 2006, the Des Moines, Iowa-based non-profit organization has trained therapy and service animals for Midwestern veterans and others, and educated and advocated regarding laws requiring service-animal access to public spaces. 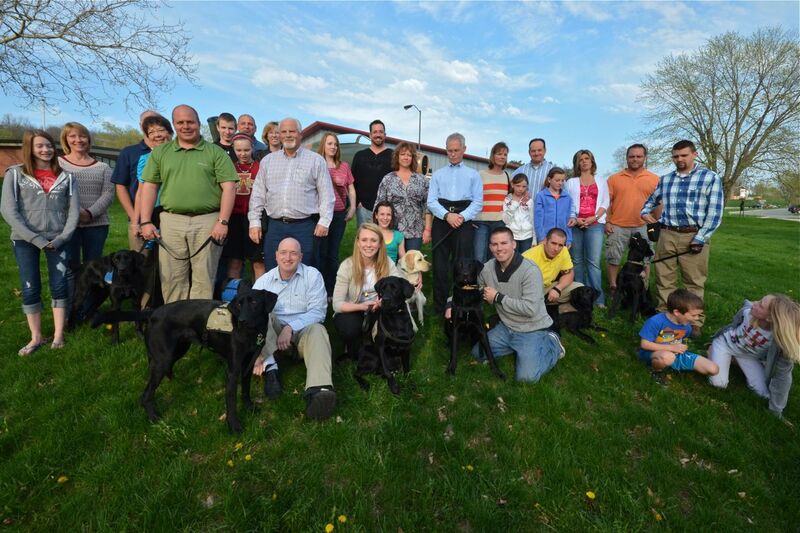 The organization is often augmented by trainers from Canine Craze, West Des Moines. In the past two weeks, the veterans have met their service dogs for the first time. They've lived, eaten, slept, played, and worked with their partners, developing emotional bonds and basic understandings. Think of it as Boot Camp, but with paws. After graduation, everything else is on-the-job training. And annual refresher courses. As with military training, classroom presentations are followed by field exercises. The veterans, now dog-handlers, learn to navigate venues such as shopping malls, movie theaters, restaurants, and airport security checkpoints. When traveling by air, the dogs are trained to lay down in the underseat luggage area. The veterans practice the maneuver on a passenger aircraft parked at the Des Moines International Airport. During the placement course, Paws & Effect temporarily bases its operations out of the Dodge House, a small, single-story facility across the street from the museum—and right next to the house inhabited by Maj. Gen. Timothy Orr, the adjutant general of the Iowa National Guard. 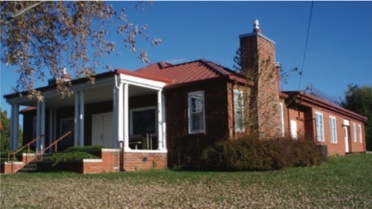 Named after the same Civil War general from which the Camp Dodge takes its name, the single-story Dodge House is often rented for social and other events. It features a kitchen, a sunroom, and a expansive front porch. After classroom discussions there, the veterans train with their dogs until both are tired, then sneak an occasional cat nap. After dinner, they watch movies and play training "games." The veterans cheekily rechristen the building the "Dog House." The puppy-raiser relationship lasts approximately 18 months, during which time the non-profit carefully monitors the health, training, and personality of each animal. Paws & Effect pays for food, medicine, equipment, and other expenses. One dog can cost the organization up to $25,000 in supplies, care, and training. At the same time, Paws & Effect identifies prospective recipients through channels such as the Iowa National Guard and the Community-Based Warrior Transition Unit (C.B.W.T.U.) at Rock Island Arsenal, Ill., an installation located on the Mississippi River along the "east coast" of Iowa. The 2012 class notably includes "Ryder" and "Archer," two of the "Red Bull" litter named last year in honor of the 34th Infantry "Red Bull" Division. Others still in training include "Havoc," "Avancéz" (who goes by "Van"), and "Sabre." "It was clear that Anthem was going to be Joe's dog from the start," says Paws & Effect director Nicole. "I just wish Tammy had told me that Anthem liked carrots for rewards. And not just any carrots, mind you: They had to be coins. And they had to have ridges." "I felt like I was writing a dating-service ad for my dog," says puppy-raiser Travis, about starting to write a note for Hero's legacy book: "'My dog is the best-looking and smartest dog.'" He ended up writing five pages. "My dog is just the right balance of challenge and complement," says one recipient. Another says, "I got my smile back." A number of the veterans observe the placement course was the first they'd slept soundly in a long time. Another veteran reports that, twice in one night, his dog had woken him from a nightmare by licking his face. Nicole notes that one veteran had neglected to tell her that he might have a leg amputated in coming months. She and the puppy-raiser gave the dog a 6-day crash course in mobility-assistance skills, such as how to retrieve objects. "At one point, I was getting hourly updates: 'The dog is picking up keys ...' 'The dog is picking up frozen peas ...'" Apparently, the training took, she says, because the veteran later wondered why "the dog will not stop handing me things!" Family members also offer words of wisdom, thanks, and humor. "During class, I was the one who asked one day about what happens when my husband and I start getting a little ... 'active,'" one spouse shares, to friendly laughter. "Would the dog think I was hurting him? The group decided I should ask you, the puppy-raisers, about that." As she makes eye contact with the couple who raised her husband's new service dog, the room breaks into giggles. Not to worry, the couple responds: The dog is fully trained. After the laughter, as promised, there is cake. And barbecue. "To everything, there is a season." It is springtime in Iowa. You don't need to be a dog to smell the possibilities. Photos courtesy of Paws & Effect. Coming Soon: A 'Red Bull' Feature Film! "Memorial Day," a Minnesota-based feature film starring Jonathan Bennett, James Cromwell and his son John Cromwell will be released to video on Memorial Day 2012. It is available for pre-order through Amazon as DVD and Blu-ray , and ships May 29. I didn't loot. And I didn't steal. I collected things that would help me remember. What I didn't count on was: They don't let you forget. You found the footlocker, Kyle, so ... I'll make a deal with you. Pick any three, and I'll tell you the story behind each one. God willing, you won't have to experience any of these things yourself. But if you do, you'll be ready. The movie premiered to an audience of Minnesota National Guard personnel and families Sat., March 31, at Riverview Theater, Minneapolis. It was also simulcast to five overseas locations, where 23 citizen-soldiers who were background actors are currently deployed with the 1st Brigade Combat Team (B.C.T. ), 34th Infantry "Red Bull" Division (1-34th BCT). The unit of approximately 2,700 members is nearing the completion of a 2011 deployment to Iraq and Kuwait. A total of 39 Red Bull citizen-soldiers—the equivalent of an Army platoon—were "extras" during filming of "Memorial Day." 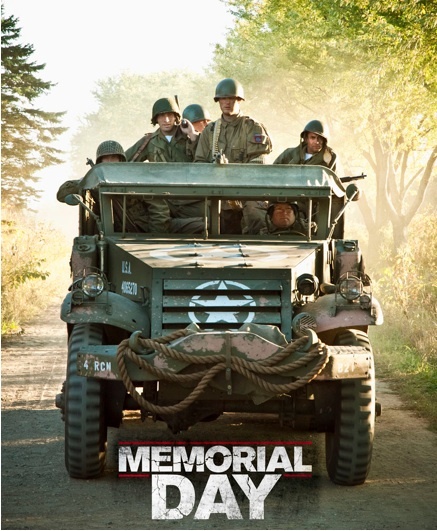 Still more Minnesota Air and Army National Guard personnel supported the movie's production with time, expertise, and equipment. In World War I, the 34th Infantry Division (34th Inf. Div.) was first organized with U.S. National Guard troops from North and South Dakota, Iowa, and Minnesota. The unit was then nicknamed the "Sandstorm" Division, although the distinctive "Red Bull" shoulder-sleeve patch was created during this time. The patch, designed by 34th Inf. Div. soldier and Regionalist painter Marvin Cone, depicts a red bovine skull superimposed on a black water jug. The unit officially took on the "Red Bull" moniker during World War II. On modern battle dress uniforms, the patch variously appears in subdued colors of olive, tan, or sage. 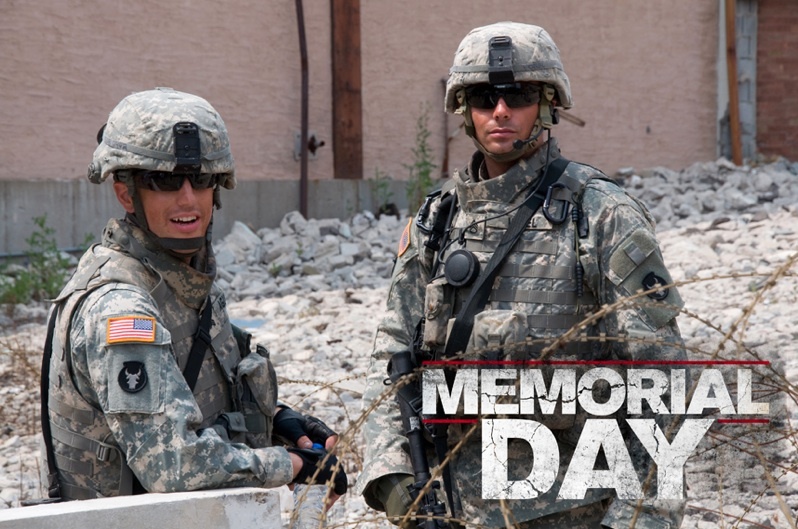 In the "Memorial Day" film, the black-and-sage Army Combat Uniform "Red Bull" patch really pops off the silver screen. And any Red Bull soldier and buff—past, present, and this one included—is likely to thrill at the sight of so many "steak sandwiches" running around. There's even a line of dialogue that calls attention to the patch! 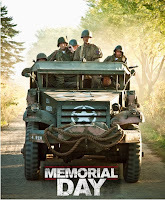 Coming soon: A Red Bull Rising blog review of "Memorial Day"! The official movie website is here. There's a publicity trailer posted there. There's also a blog written by screenwriter Marc Conklin here. And a Facebook page here. There will be limited screenings and festival showings leading up to the May 29 release date, including a spot at the 2012 G.I. Film Festival in Washington D.C. on May 19. The film will also be shown as part of the 2012 Minneapolis-St. Paul International Film Festival, April 21, at the St. Anthony Main theater. The three-week festival is billed as "a celebration of independent filmmaking from around the globe will include some 250 documentary, narrative, and short films from more than 60 countries," including those made in Minnesota. Click here for festival details. The film will be shown at the Newport Beach Film Festival on Sat., April 28 at 3:45 p.m., Triangle Square 6, Costa Mesa, Calif. Click here for festival details. Or, as previously mentioned, pre-order the movie through Amazon as DVD and Blu-ray . The discs ship May 29—the day after Memorial Day. Some making-of videos of "Memorial Day" (then known as "Souvenirs") involving WWII re-enactors are available on YouTube here, here, and here.